Mamarazzi love Tangkak Beef Noodles since having it first time in Malacca. 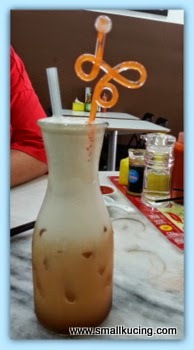 Earlier of the year, Mamarazzi read in Mun's blog that they have opened an outlet in Kuchai Lama. Next trip to hypermarket, she bought bight packet of carrot and juiced for me to drink daily till I also jelak liao. She had Ice Blended Jasmine tea which leaves her puzzled. For a moment there she thought she ordered 3 layered tea. . Funny Mamarazzi. Papa's bowl of mixed Beef Noodles with Lai Fun Really SLURPSSSS to the max. 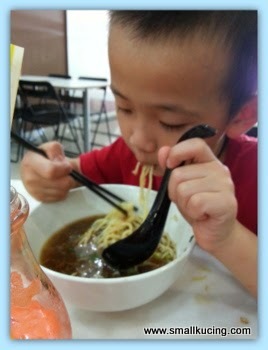 Mamarazzi and me had ala-carte plain bihun and yellow noodle respectively. Nah.....actually we ordered another bowl of Mixed Beef. From there Mamarazzi can have her favourite stomach while I have the meat balls. Good to the last strand...still as good as the ones we had in Malacca. Here is the address of the shop No 35, Jalan Kuchai Maju 8, Kuchai Entrepreneurs Park, 58200 Kuala Lumpur. If you are a fan of Beef Noodles, do give it a try. 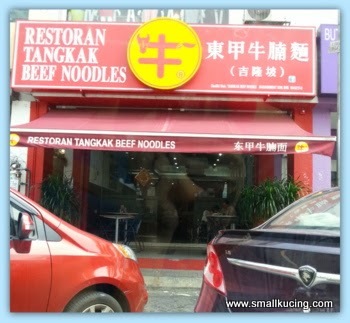 When I read this, I was wondering if tangkak in johor really famous for their beef noodles ! Never heard of yet. Need to check around. So jahat! People say drink tea, drink tea lah. 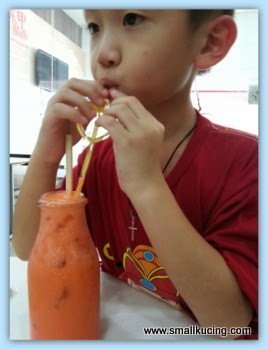 So kaya, want to drink carrot juice - like that, give sugar cane juice better!!! Rotan kao-kao! Muahahahahahaha!!!! The is the BEST looking food you have ever posted!!! I so much wish I could go there! I have never tried carrot juice. Elo dear, yesterday was having training, today only come back.. So today only free to read and visit blogs la.. Hope you all don't post so many new posts first, coz old ones also I not yet read la, ok? Oohh, beef noodles, I will never get bored of it.. I can eat everyday for a few weeks timmm.. Hubby also a big fan of beef.. But beef hor, is not cheap.. I bought some ribs (and bones) from Jusco last week, a small packet already cost RM15 !! Less than 6 bones inside only you know.. I bought it to boil soup.. 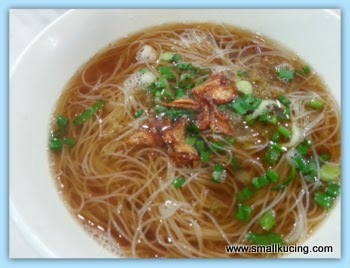 I think 3-4 packets also not enuff if want the soup to be "yap mei".. If 3-4 packets, already RM60 babe !! Crazy !! wah got training some more ah. Slurp!! Can smell the ngow lam here also.. hahaha..
oh, Uncle SK also like the beef noodles from the Restoran Tangkak.. last time he had it at Jalan Imbi but two times, but then after that closed down already.. only then gotta know they moved to somewhere in Cheras, and now in Kuchai Lama pulak?? did they moved there or this is a new outlet?? wah, very nice lah!! Uncle SK is drooling now.. and this time Mamarazzi smart eh, ordered plain noodles for Small Kucing and then tambah extra bowl of mixed beef and balls.. ah, like that sure Small Kucing likes, because plain noodles he can eat and no need to chew so many things.. wah, look at the soup, macam loaded aje, nice!! I can see the deliciousness though never beef is a taboo for us. Wah small kucing knows how to enjoy carrot juice and mamarazzi knows how to fix small kucing's thirst for carrot juice. Beef noodles - my favourite too. 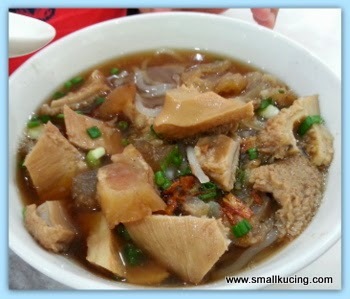 Aiyo....heard so much of this Tangkak beef noodle but I never have the chance to taste it yet. haha.... My dad loves the one in Tangkak itself.... I think it is situated along the main road but I don't know which shop. Seremban one is a bit different. Normally I will opt of dry version. 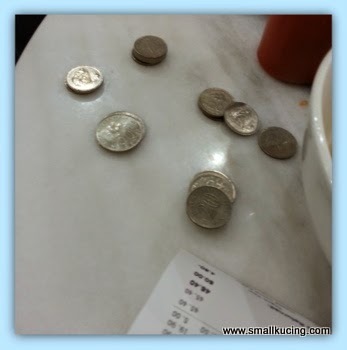 Small Kucing can really eat la! See the bowl, almost empty! I don't mind beef, but I don't dare to eat the spare parts. The stock must be good!! most people seem to like beef but not me. Anyway, the noodles look yummy..